With spectacular ocean views, some of the best farmland in the state, and the possibility of building energy efficient homes, it is easy to see why the new agrihood community of Kuwili Lani in Laupahoehoe is attracting a lot of interest on Hawai’i Island. In Hawaiian culture, a great deal of emphasis is placed on where one resides, as it is believed that the beauty and natural environment of the area shapes the people that live there. Small in size, covering slightly more than two square miles with nearly 600 residents, Laupahoehoe has a lot going for it. It is home to the Laupahoehoe Music Festival, a train museum, large beach park, community pool, schools, and a multitude of outdoor activities. Add dramatic waterfalls nearby, lush tropical landscapes, and easy access to Hilo, and you will see why home buyers looking for Hamakua real estate are looking at Laupahoehoe land for sale. Situated on the slopes of the Hamakua Coast at an elevation of 550-650 feet, Kuwili Lani is a slice of heaven. Laupahoehoe was once a thriving sugar cane plantation town and along the route of a popular railway system that transported sugar cane and residents alike to Hilo. Less than a quarter mile from the coastline, this newly created private community offers amazing ocean and pastoral views, while enjoying temperate weather all year long. With just the right amount of rainfall and deep rich soil to support year-round growing conditions and a rich history of agriculture, Kuwili Lani’s location is an ideal place to implement the community’s Agricultural Neighborhood concept of growing healthful food/edible landscape within the subdivision. Homeowners can purchase Big Island land in Kuwili Lani, build an energy-efficient home, and turn their yards into productive gardens that pay for themselves over time with a vast variety of locally grown produce and fruits. 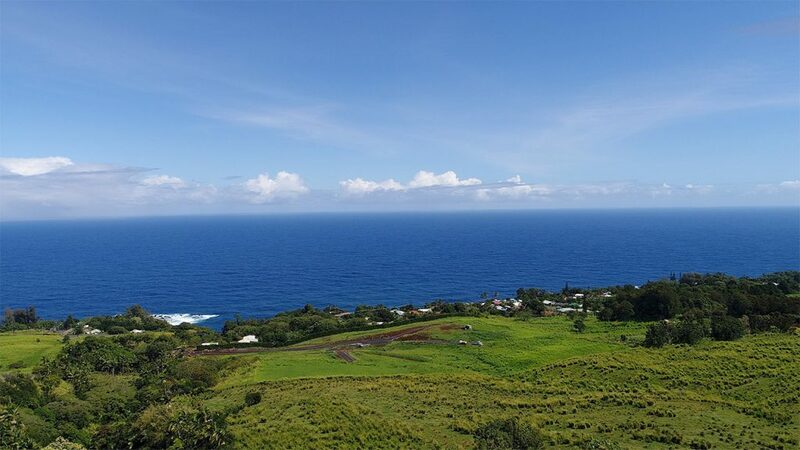 Comprising of slightly less than 14 acres, the topography of Kuwili Lani includes two Pu’u, or hills, within the subdivision, which enables every lot to enjoy panoramic views of the ocean, the surrounding pastures, and expansive sky vistas. It is truly a tranquil and beautiful location. Kuwili Lani’s pastoral location is ideal as an agrihood. There are numerous options to plant orchards on the gentle slopes, with spacious level ground areas for gardens, greenhouses, and aquaponic operations. The entire 13.9-acre subdivision has secure perimeter fencing, keeping feral animals from getting into the gardens, as well as providing enhanced privacy and security. A small, gated neighborhood, Kuwili Lani is only a 3/4-mile stroll to the main highway and basic services in the hamlet of Laupahoehoe. An intentional community built on the tenets of sustainable living, Kuwili Lani provides a sense of place where one belongs and feels at home. If you’d like to learn more about this new agrihood community, contact Julie Keller today!